It’s been 16 years since Columbia – NASA’s flagship shuttle in its orbiter fleet – disintegrated while attempting a re-entry to Earth on February 1, 2003. An in-flight break up while entering the Earth’s atmosphere led to the disaster. Today is also the 16th death anniversary of the first Indian-origin woman to have flown into space, Kalpana Chawla and six other astronauts who lost their lives aboard the Columbia space shuttle. This tragedy shook the entire world and its debris still lies in our hearts and minds. On this occasion, we bring to you some facts about the Columbia space shuttle and its last mission STS-107. Columbia, the first reusable spacecraft, was the first space shuttle to fly into space on April 1981. Columbia is said to have successfully completed 27 missions before the doomed STS-107 mission. Mission STS-107 was originally scheduled to begin on January 11, 2001. However the mission was delayed 18 times and finally was launched on January 16, 2003 from Kennedy Space Center in Florida, USA. 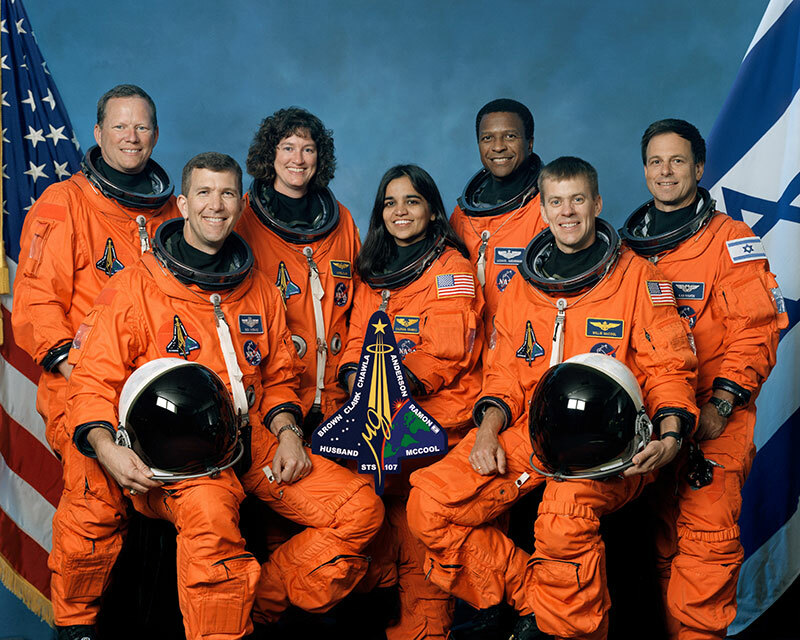 The seven-member crew onboard of the Columbia space shuttle were Rick Husband, commander (America); Michael Anderson, payload commander (America); David Brown, mission specialist (America); Kalpana Chawla, mission specialist (India); Laurel Clark, mission specialist (America); William McCool, pilot (America); and Ilan Ramon (first Israeli astronaut) payload specialist from the Israeli Space Agency. During the mission, the crew spent 24 hours a day performing scientific experiments in two shifts. They performed around 80 experiments in material sciences, life sciences, fluid physics and many more. On the fateful day of February 1, 2003, the space shuttle Columbia disintegrated over East Texas while reentering the Earth’s atmosphere as it was about to conclude its 28th mission. The shuttle disintegrated 16 minutes prior to its scheduled landing. Debris were scattered across East Texas, Arkansas and Louisiana. This disaster was the second fatal accident in the space shuttle programme after Space Shuttle Challenger that broke apart 73 seconds into its flight, killing all seven crew members in 1986. On the day of the accident, Columbia made its usual landing approach to the Kennedy Space Center. Just before 9 a.m. EST, abnormal readings showed up at Mission Control. Temperature readings from sensors located on the left wing were lost. Then, tire pressure readings from the left side of the shuttle also vanished. Immediately after the disaster, NASA convened the Columbia Accident Investigation Board to determine the cause of the disintegration. According to the investigation, the main reason for the shuttle’s technical breakdown was a piece of foam that broke off during launch and damaged the thermal protection system on the leading edge of the orbiter’s left wing. During re-entry the damaged wing slowly overheated and came apart, eventually leading to loss of control and disintegration of the shuttle. The accident triggered a seven month long investigation and search for debris. Over 85,000 pieces were collected over the course of the initial investigation. This amounted to roughly 38 percent of the orbiter vehicle. After the disaster, Space shuttle flight operations were suspended for more than two years, as it had been after the Challenger disaster. The cockpit window frame is now exhibited in a memorial inside the Space Shuttle Atlantis Pavilion at the Kennedy Space Center. Much later, in 2008, NASA released a crew survival report detailing the Columbia crew’s last few minutes. The astronauts probably survived the initial breakup of Columbia, but lost consciousness seconds after the cabin lost pressure. The crew died as the shuttle disintegrated. One of the crew members who were killed was Kalpana Chawla – India’s very own pride who was onboard as a mission specialist. Born on March 17, 1962 in Karnal (Haryana), India, Chawla was the first Indian origin woman to venture into space. Chawla first flew on Space Shuttle Columbia in 1997 as a mission specialist and primary robotic arm operator. With her two missions in space, Chawla had logged a total of 30 days, 14 hours, and 54 minutes in space. Chawla’s remains were identified along with the rest of the crew members and were cremated and scattered at National Park in Utah in accordance with her wishes. The Columbia’s space shuttle mission STS-107 crew was posthumously awarded the Congressional Space Medal of Honor.